Emojipedia has released the official list of emojis that will be released this year, including a new emoji that mocks men with small pen*s.
The rude emoji which is one of the 270 new emojis that will be released in 2019, shows a hand doing a pinching motion to depict a small pen*s.
The announcement which is the sixth major update since 2014 shows a wide scope of people represented, including people with various disabilities, gender couples, and as well emojis with a mix of skin tones for people holding hands. Thanks to Apple which submitted a number of designs, people with physical disabilities are now represented with emojis that includes a range of wheelchairs, sign language, a blind person, a deaf person, ear with hearing aid, guide dog, etc. 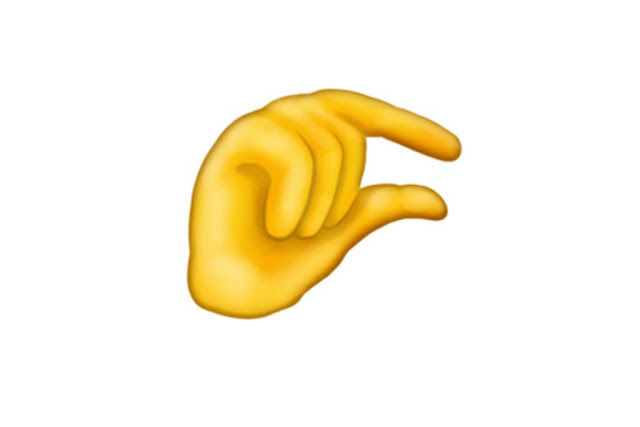 However, the one that has grabbed people's attention is the "pinching hand" emoji that depicts a small pen*s. Some people say its a good idea while others think it isn't. In fact, others even argued that if an emoji was made to depict a male small organ, there should be an emoji for females too... maybe one depicting shaggy b**bs. Other emojis includes a yawn, ballet shoes, diving mask, briefs, Auto Rickshaw, etc. This emoji update comes with animals, including Orangutans, Sloths, Otters, Skunks and Falmingos. Users should start seeing update to their apps and operating system between and April and December 2019.